Denny Hamlin feels like he’s finally making up for lost time. The rising NASCAR Sprint Cup star grabbed three of his four 2009 wins in the last 11 races and spent the winter months listening to people say he was the favorite to end Jimmie Johnson’s record string of four straight championships. Then Hamlin got hit by a double-whammy. In January, he tore the anterior cruciate ligament in his left knee. That quieted a lot of the title talk, and most of the rest of that chatter died out when Hamlin, still bothered by that damaged and aching knee, failed to finish better than 19th in the first five races of 2010. After turning things around with a win at Martinsville, Hamlin took advantage of a week off the track to undergo surgery to repair the tear in his knee. He was back in his No. 11 Joe Gibbs Racing Toyota for the next race at Phoenix and, despite having Casey Mears standing by, ignored the pain in his surgical knee to run the entire race. Despite a 30th-place finish, Hamlin had proved his determination to himself and his team. He even told crew chief Mike Ford, “Don’t ask about the knee’’ during the race. 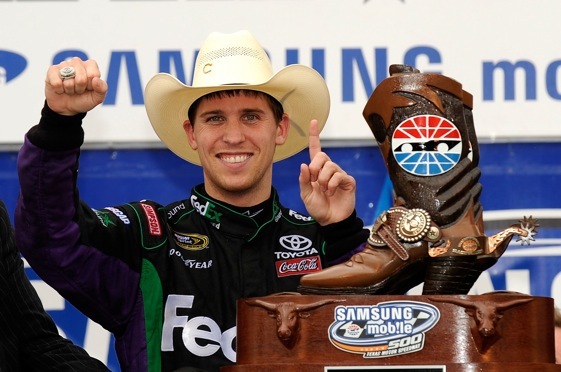 Since that gutsy Phoenix performance, Hamlin has won at Texas, finished fourth at Talladega, 11th at Richmond and took the 11th checkered flag of his Cup career last Saturday night at Darlington, where he also won the Nationwide Series event the previous night. After falling to 19th in the Cup standings after the Bristol race, Hamlin has driven solidly into the hunt for a spot in the Chase for the championship, sitting sixth heading to Dover this week. This latest rash of race victories is apparently no surprise to Hamlin, who believes he has learned how to win. “Well, during the course of my career I felt like I missed out on a lot of wins,’’ he said after the least win. “Probably two to three years of my career, probably 10 of them I should not have lost had I had the mindset that I have right now, what it takes to win. The confident Hamlin, whose knee feels a little better each day, expects it to continue. “Now I feel like I have a better understanding of that, I think it’s gonna continue to go on a roll the way it is,’’ he said. Hamlin said the only surprise to him is that the wins are coming this early in the season. “We thought we could contend for race wins, maybe get one here or there the first 12 (races),’’ Hamlin said. “We really wanted to come on right after Indy. That was our goal, to turn the light switch on and really go for it. “We’re working on the back half of the season right now,’’ Ford noted. “Honestly, I’m surprised how strong we are right now. Still, Hamlin is sending a clear message: Look out come Chase time.